Las Vegas hosted Real Madrid's game against Santos Laguna this Sunday night and the Merengues managed to put on a solid performance against one of the strongest sides from the Mexican league. Cristiano Ronaldo was a starter for the first time this pre-season, as he continues pursuing his best form. 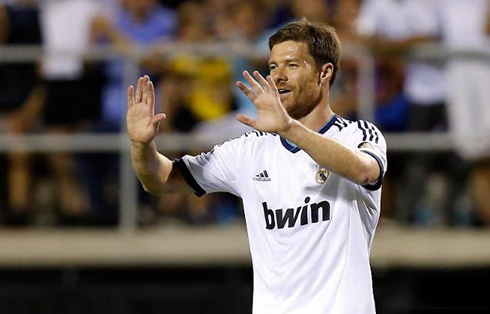 Xabi Alonso on the first half and Sami Khedira late on the second period, scored the Spanish champions goals. This United States pre-season tour includes four friendly matches in a 2-week time span and even though last night's opponent was probably the less known worldwide, they surely proved to be a good test for José Mourinho's side. After beating Oviedo, losing to Benfica and then returning to victories against the LA Galaxy, Real Madrid felt the need to start a winning streak that will probably provide a marginal confidence boost for the upcoming weeks and the first official matches of the season, against Valencia CF and Barcelona. As expected, Real Madrid controlled most of the game against Santos Laguna and the first goal ended up being only a matter of time. Still before the first 15 minutes have run out, Cristiano Ronaldo assisted Xabi Alonso for a long range shot well outside the area. The Spanish midfielder's curled shot want straight to the goalkeeper's right post, leaving him with no chance to reach the ball, that even went through the side net. 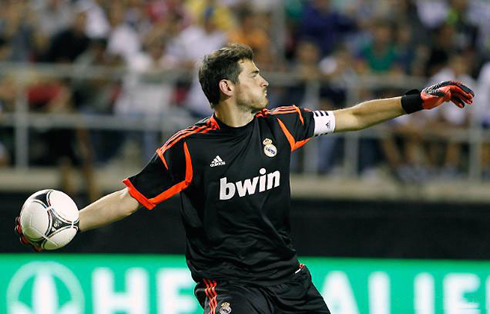 Real Madrid had just taken the lead, but Santos Laguna was not giving signs of giving up so early in the game. Santos Laguna finished 4th in the Mexican league last season, but if there's one thing that most of the teams on that league have, that's surely the fighting spirit. With 25 minutes on the clock, the equalizer arrived from a goal scored by Cristian Suárez and the Merengues defense not looking good in the picture. A small lob into the back of Arbeloa, allowed Suárez to find himself alone and with the opportunity to take a 1-on-1 chance against Iker Casillas. With so much time to finish the play, the Santos Laguna forward didn't miss it and levelled things up at 1-1, a result that would drag until half-time. After the break, José Mourinho rotated every player that had started the game, which means Cristiano Ronaldo was spared from playing the remaining 45 minutes. The Portuguese player is still far from his A-game, which is perfectly natural given the fact that this is still his second game of the pre-season. One of the best players on the pitch throughout the second half has been Karim Benzema and it was from the Frenchman feet that the second goal arrived. Kaká took a corner kick on the right attacking side, that met Benzema on the far post and ready to strike the ball without much preparation. The shot was then blocked by Santos Laguna goalkeeper, Osvaldo Sánchez, but immediatly hit Sami Khedira's head and went back to pass the goal line. The lucky goal allowed Real Madrid to take the lead, assuring that José Mourinho's side would reach their 3rd victory of this pre-season.